But let’s be real. Residents don’t bear the costs for inviting pests in—you do. That means there are a lot of opportunities for you to be left on the hook for thousands of dollars in treatment and clean-up. Pest prevention in multi-family residences is a shared responsibility. One compromised kitchen is all it takes for an introduction to become a full infestation. And what’s more, this transition can happen astonishingly quickly, with bugs or rats taking up residence and multiplying before you even know they’ve arrived. That’s why it’s important to educate residents on how to prevent these unwanted visitors early and often, before you end up with a major problem. If left unchecked, you could have multiple units brimming with ants, house flies, rodents, cockroaches and other crawling critters—none of which are pleasant roommates. Residents who follow these simple steps can help make your building a safer and healthier place to live for everyone. Plus, each of these actions only takes a few extra minutes during their day. It’s a small price to pay compared to dealing with a swarm of pesky intruders. Want more details about how to keep your residents in the know? 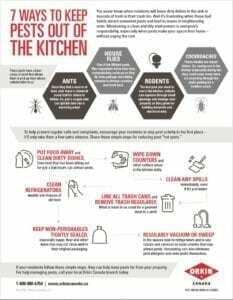 Download “7 Ways to Keep Pests Out of the Kitchen” to learn more kitchen-specific pest prevention in multi-family units.